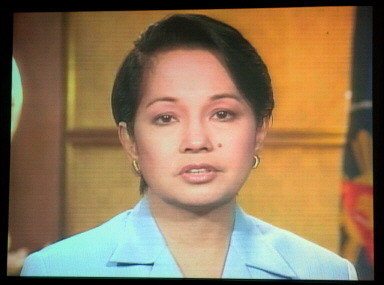 Thirteen months after her term as president ended, allegations that Gloria Macapagal-Arroyo cheated in the 2004 elections, where she was the proclaimed winner over popular movie-actor Fernando Poe, Jr. (FPJ) persists. In fact, it even gained traction with the recent confession of former Maguindanao election supervisor Lintang Bedol and ex-Autonomous Region of Muslim Mindanao Gov. Zaldy Ampatuan that vote-rigging really happened not just in 2004, but also in the 2007 senatorial polls (that time in favor of administration candidate Juan Miguel Zubiri). Meanwhile, Senior Superintendent Rafael Santiago surfaced last week to say that he and a handful of policemen sneaked into the premises of the House of Representatives in early 2005 to replace the 2004 election returns with fake ones. At that time, FPJ’s camp is still protesting the results of the eections. The alleged chief architect of this purported cheating, former COMELEC commissioner Virgilio Garcillano, meanwhile surfaced last July 30 to deny that he was in cahoots with President Arroyo in any of the claimed election irregularities. For the last several weeks, the issue of the tape recordings has spun out of control. Tonight, I want to set the record straight. You deserve an explanation from me, because you are the people I was elected to serve. As you recall, the election canvassing process was unnecessarily slow even after the election results were already in and the votes had been counted. I was anxious to protect my votes and during that time had conversations with many people, including a Comelec official. My intent was not to influence the outcome of the election, and it did not. As I mentioned, the election has already been decided and the votes counted. And as you remember, the outcome had been predicted by every major public opinion poll, and adjudged free, fair and decisive by international election observers, and our own Namfrel. That said, let me tell you how I personally feel. I recognize that making any such call was a lapse in judgment. I am sorry. I also regret taking so long to speak before you on this matter. I take full responsibility for my actions and to you and to all those good citizens who may have had their faith shaken by these events. I want to assure you that I have redoubled my efforts to serve the nation and earn your trust. Nagagambala ako. Maliwanag na may kakulangan sa wastong pagpapasya ang nangyaring pagtawag sa telepono. Pinagsisisihan ko ito nang lubos. Pinananagutan ko nang lubusan ang aking ginawa, at humihingi ako ng tawad sa inyo, sa lahat ng mga butihing mamamayan na nabawasan ng tiwala dahil sa mga pangyayaring ito. Ibig kong tiyakin sa inyo na lalo pa akong magsisikap upang maglingkod sa bayan at matamo inyong tiwala. I took office with a mandate to carry out a plan for the nation. Since that time, I have focused on making the tough but necessary decisions to make up for years of economic neglect. We passed a comprehensive, fiscally responsible national budget; raised new and necessary revenues to invest in the people; and implemented new anti-corruption measures that have led to the highest collection of taxes in history. Nothing should stand in the way of this work, or the next phase of my reform agenda, which includes new investments in education and social services with our new revenues; and an expansion of our successful, anti-corruption and lifestyle checks. That is why I want to close this chapter and move on with the business of governing. I ask each and everyone of you to join hands with me in a show of unity, to help forge one Philippines, where everyone is equal under the law, and everybody has the opportunity to use their God-given talents to make a better life. Our nation is strong and getting stronger. The progress is steady and I ask you to walk with me on this journey to rebuild our great nation. I remain your humble servant and promise you that I will fulfill my constitutional oath of office to serve the people to the best of my ability. This entry was posted on Monday, August 1st, 2011 at 4:23 pm	and tagged with gloria macapagal-arroyo, hello garci scandal, lintang bedol, news, philippines, politics, virgilio garcillano and posted in journalism, philippines, politics. You can follow any responses to this entry through the RSS 2.0 feed.